The Cougars are halfway through the 2018 season and sit comfortably at 5-1 and 2-0 in the conference. 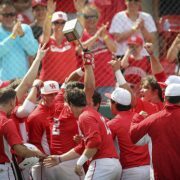 Starting today, GoCoogs.com will present a set of data-driven articles on the first half of the season. Our 1st: a look at how the UH schedule and the American stack up against the rest of the country. In the first half, UH opponents are 12-26 on the season (11-21 outside of games with UH). Texas Tech (4-2) is the only previous opponent with a winning record. On the remaining schedule, South Florida (6-0), Temple (4-3) and Memphis (4-3) each have a winning record. Of UH’s 8 AAC opponents, only USF and Temple have winning records in the league to this point (USF is 2-0, Temple is 3-0). As you’ll see in the chart below, UH’s strength of schedule is historically weak: #123 according to Sagarin and 114 in the Massey. I believe those SOS numbers will get better but, according to Massey, the 2018 schedule is on-track to be the worst in school history (dating back to 1960). 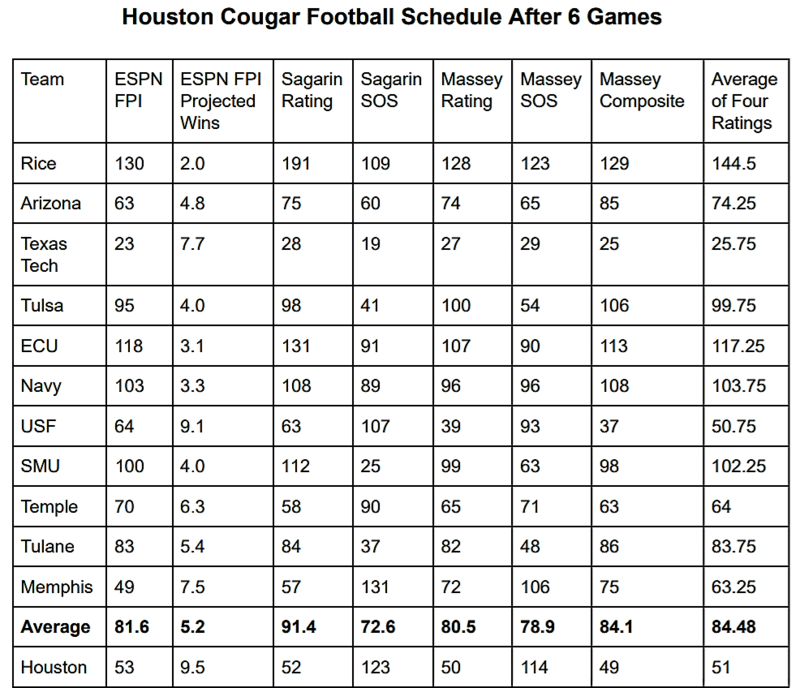 The 2007 schedule had an SOS of 106 and the 2014 schedule is currently the worst-ever at UH with an SOS of 107. Below is a breakdown of statistical rankings from several sources. We averaged the four main rating systems in the last column and included all of UH’s totals as a comparison. Notes: “Average of Four Ratings” includes the FPI, Sagarin, Massey, and Massey Composite. Texas Southern is not included – FCS teams are not included in 5 of the 7 ratings above. The Sagarin SOS includes the TSU game while the Massey SOS does not. That accounts for some of the difference in the two (TSU is ranked 243 out of 255 in the Sagarin). Statistically, Rice is pretty much the worst FBS team in the country. By the numbers, Texas Tech is a borderline top 25 team. 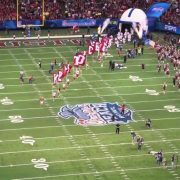 With 130 teams, the median FBS team is 65. According to FPI, 7 of our FBS opponents fall in the bottom half of the country (4 in the top half). That number is 8 in the Massey (3 in the top half) and 8 in the Massey Composite. UH’s consensus best win is Arizona, as expected. But all 4 FBS teams the Coogs have beaten are rated in the bottom half of the country in a majority of the rating systems. 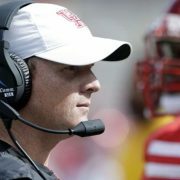 The average rating of UH’s 4 wins is 101.5 (FPI), 123.75 (Sagarin), 102.25 (Massey), and 108.25 (Massey Composite). FPI and Sagarin have two of our wins ranked 100 or higher while Massey and Massey Composite have 3 wins over 100+ teams. Using the 4 rating systems, UH is more consistent across the ratings than anyone on our schedule (or anyone else in the AAC). With an average of 51, all four rankings have the Cougars between 49 and 53. While teams rated higher than 100 will have bigger swings, it’s puzzling to see USF rated as high as 37 (Massey Composite) and as low as 64 (FPI). The FPI doesn’t believe in Charlie Strong’s team: they have the Bulls going 3-3 in their final 6 games. Memphis has a pretty wild swing, too: from 49 in FPI to 75 in the Massey Composite. Kudos to Tulsa, SMU, and Tulane for playing top-half schedules. 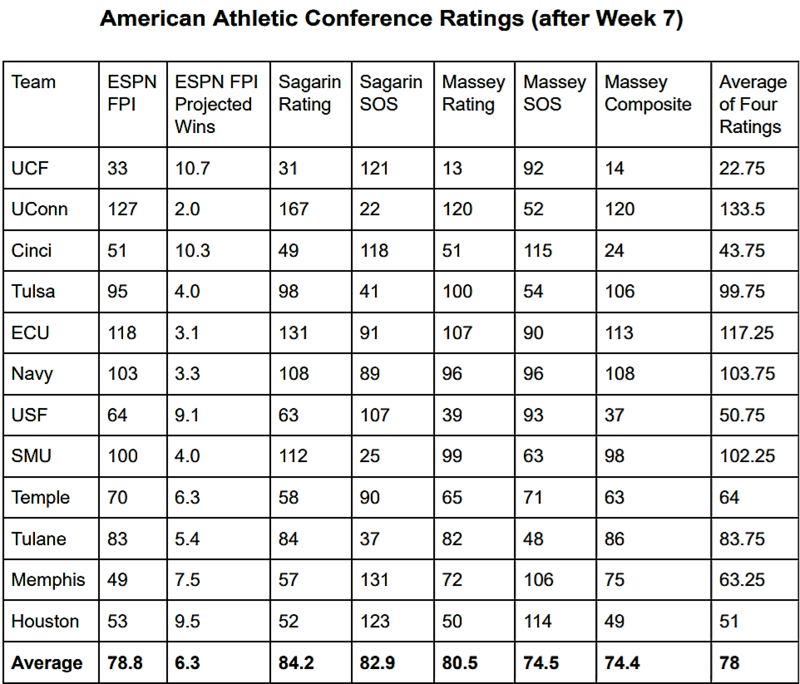 All 3 AAC teams have a scheduled rated in the top half by both SOS systems. UConn has also has a top-half schedule (22 in Sagarin, 52 in Massey). According to current data, the Cougars should be favored over the next 5 opponents and a slight underdog at Memphis. Let’s take a quick look at the AAC as a whole, including the 3 teams UH does not face this year (UCF, UConn, and Cincinnati). The average of AAC teams using the 4 rating services is 78th – well below the national median of 65. That’s not good for a conference touting itself as P6. In the preseason, the FPI projected 6 AAC teams with six wins or better: Memphis at 9.9 wins, UCF with 8.3, USF with 7.7, UH at 7.3, Navy 6.8, and Temple 6.3. Memphis was the highest-rated AAC team at #49 in the FPI preseason ratings. The East has been a far-better division than the West this season: the East has 3 ranked teams and they are all 6-0. 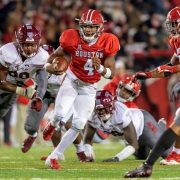 Because of cross-division scheduling, UH avoids 2 of the 3 ranked teams from the East. Meanwhile, the East is 25-12 while the West is 16-21 overall. The East is 6-2 against the West in 2018 – and the two wins from the West were against the worst teams in the East (Memphis beating UConn and UH over ECU). The East has 4 teams with winning records (combined 22-3) while the West has just UH and Memphis (combined 9-4).